This is a post I’ve promised to write for a while, this isn’t a critic of ‘Agile’ in any of its guises but simply a guide to avoid incorrect statements. A Sprint is essentially a time-box, nothing more nothing less. How the time-box is used depends on the team’s implementation. I’ve seen Sprints used to simply slice up months of development. Whilst I suspect that this practice is not uncommon I think most people would recognise a Sprint from definition popularised by the Agile strategy, getting close to process, of Scrum. Here a Sprint is typically used to create a small deliverable. There are many good reasons for this; quick feedback, leave in a deliverable state, focused priority based development, etc. However, a Sprint neither makes a development Agile nor it is necessary to be Agile. I say again, Sprint != Agile and Agile does not need Sprints. When the team changes then Velocity becomes very suspect. How significant the change is will depend on the team changes but you need to be aware that it will affect the measurement. Velocity is more useful when the tasks are in the ‘Order’ domains. These are the tasks that we fully understand regardless of if they are easy or complicated to implement. However, anything outside of that becomes an unknown. I.e. if your last Sprint was Ordered then you will have a velocity of O, but if your next Sprint in Complex then you are likely to have a very different velocity of C. This means that for the third Sprint your Velocity is (? )… O, C, O+C/2, etc. 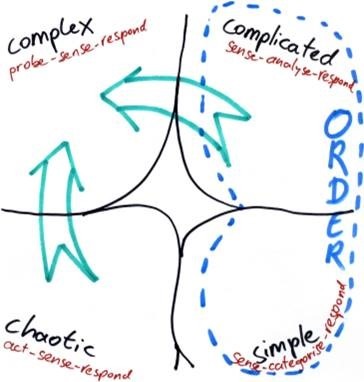 We cannot even say that all complex Sprints are always C. If you consciously look out for Complex tasks then you can mitigate them by converting them, as much as possible, to the Order domain via non-deliverable Spikes. In this strategy you honour the goal of velocity in the sense of knowing what will be soon be started, but not necessarily about stating how much you can deliver for any given future milestone. Be warned, Velocity can be useful but it can also be very misleading. If you do choose to measure velocity then use it wisely. Another popular mechanism with Agile development is the Burn Down Chart. The premise is simple, start the graph with showing the amount of work to be done, and as the work is completed the graph will tend towards zero, i.e. the development has completed. However, in my experience this rarely shows an accurate view of the development. The problem is that teams do not stick with the items in a Sprint. Often other items creep in, be it additional features or bugs. Nothing wrong this, after-all we should be expecting change (not wishing to start a discussion about using the size of Sprint to mitigate this). The problem is that it is now very difficult to discern from old or new work. If the burn-down chart is a flat line is that telling you that you haven’t completed any work or that the input of work has matched the output? Whilst I’m struggling not to criticize Burn-Down charts it would remise not to mention Burn-Up charts that provide the same information but can also resolve this confusion. See Pawel Brodzinski’s excellent review of the issues. This post has mentioned Scrum a few times, and there can be no denying its popularity with Agile devotees. Another popular strategy is that of Kanban. I have read a number of conversations that take the form of Scrum vs. Kanban and offer them up as a polar choice. Essentially Kanban is about assessing your current process and smoothing it out. If your current process, oh dear I’ve said process, is Scrum then you can apply Kanban to it. It’s not one or the other. In reality, if your development suits Kanban then over a period of re-assessment then you may find that many of the Scrum stages are also causing your bottlenecks and you will end up dissolving some of them, including Sprints. However, again that is not the conclusion of using Kanban, it is one possible outcome. It all depends on what best suits your particular issues. I’ve had these conversations a number of times, so I hope other people will find it useful. When something is Agile, look back to the manifesto and evaluate the rationale. If it doesn’t help you with those goals then challenge why you should be using it. Next Article Is there room for Estimates and Forecasting?